Some of us have heard and seen the interesting Penang street art – but do you know that the artist (Ernest Zacharevic) who painted those works had also done quite a few of these street drawings/paintings here in Singapore – don’t worry, these drawings ain’t considered as vandalism as they are commissioned by marketing company amcasia! and a private home owner. You will be able to spot some of Zacharevic’s works around the Kampong Glam and Joo Chiat areas. We did some research for clues of where these street drawings and traced each of these artworks down (Jousting Painters, the 3 Minions Bollards, Children playing in Supermarket Carts/Trolleys, Children somersaulting from boxes and Giant girl caressing a lion cub). If you are interested in finding them, we have attached maps to guide you from the nearest MRT stations – read on to find out more. 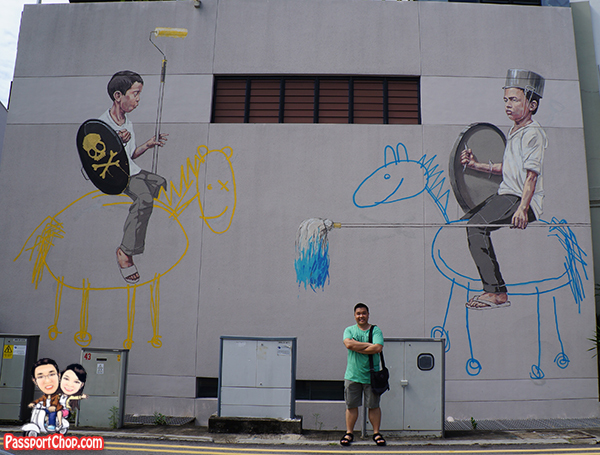 We have, however, not checked out Ernest Zacharevic’s painted street mural in Little India e.g. on the side wall of a shophouse facing Perak Hotel in Little India. 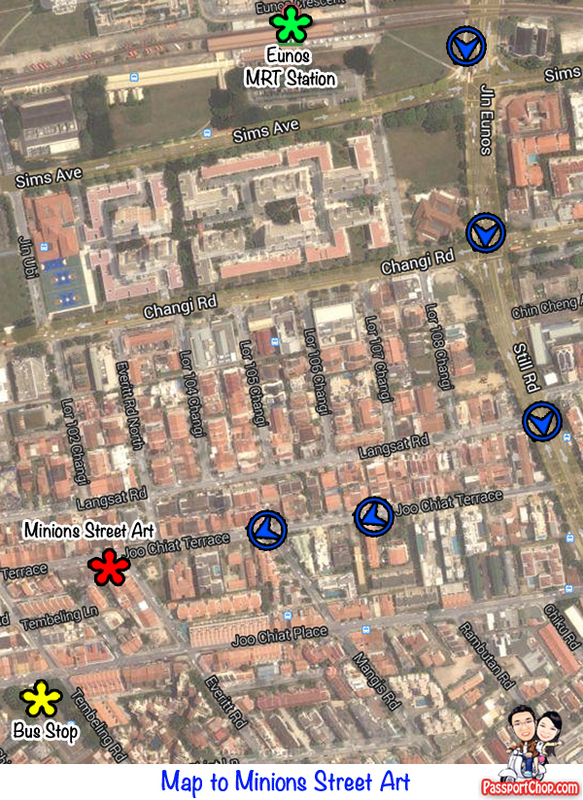 The ones we found are those at the intersection of Everitt Road and Joo Chiat Terrace as well as those along Victoria Street. If you are doing this trip to find Ernest Zacharevic’s street art by foot and public transport, I strongly recommend that you start your journey from Eunos MRT. From Eunos MRT, walk along Still Road until you reached Joo Chiat Terrace and then walk along Joo Chiat Terrace until you reach the intersection of Joo Chiat Terrace with Everitt Road – it is quite unlikely you will miss it as the picture of the Jousting Painters (see picture below) is quite prominently painted on the side wall of a terrace house here. Do note that it is quite a long walk – try to start early and make the necessary preparations e.g. water and umbrella/cap. Just beside the Jousting Painters, you will be able to find the 3 Minions painted on bollards. You might not be able to see them initially as they will most probably be surrounded by trash bins – just wheel them to the side so you can get a good picture of the 3 Minions. Are the Minions bandits or just trying to shield themselves from the rubbish smell in the trash bins – it is up to your interpretation. 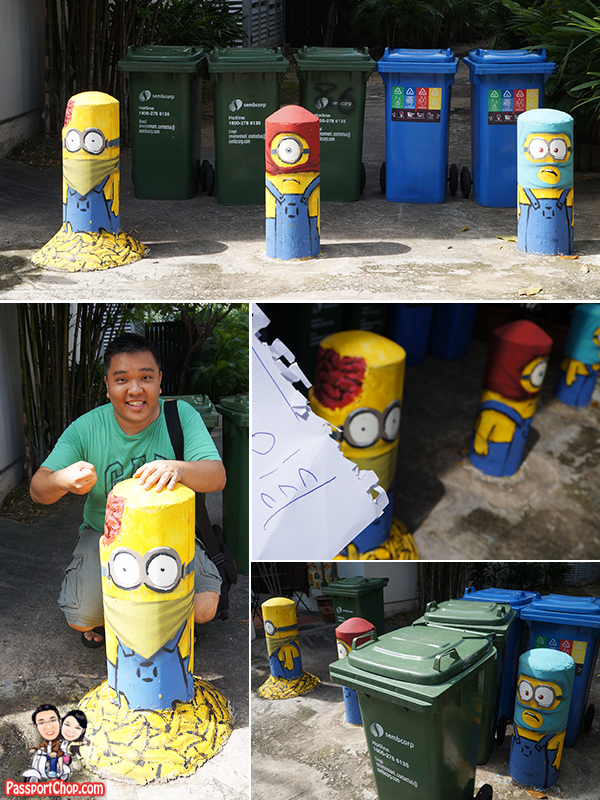 What’s most interesting about the Minions is perhaps the Minion with its “brains” exposed – it appears that Ernest Zacharevic had improvised on the damaged bollard by painting it differently from the other two! The picture below shows how close the Jousting Painters and the 3 Minions are – at the intersection of Everitt Road and Joo Chiat Terrace. 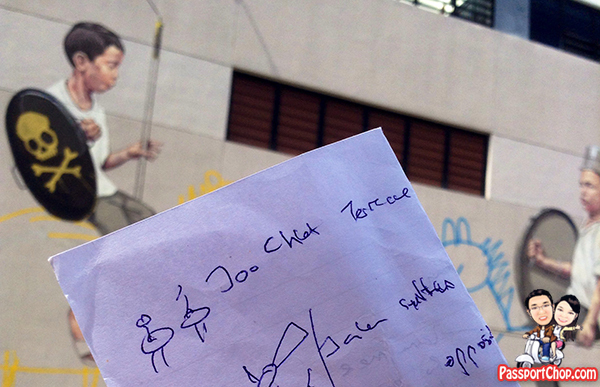 As an added bonus, you will be able to find a terracotta warrior with sunglasses at the porch of the shophouse to the right of the Minion with its brain exposed – not part of Ernest Zacharevic’s work (but still interesting nonetheless). Do note that the area around these artwork is still private property so try not to be noisy or disturb the residents in the area. 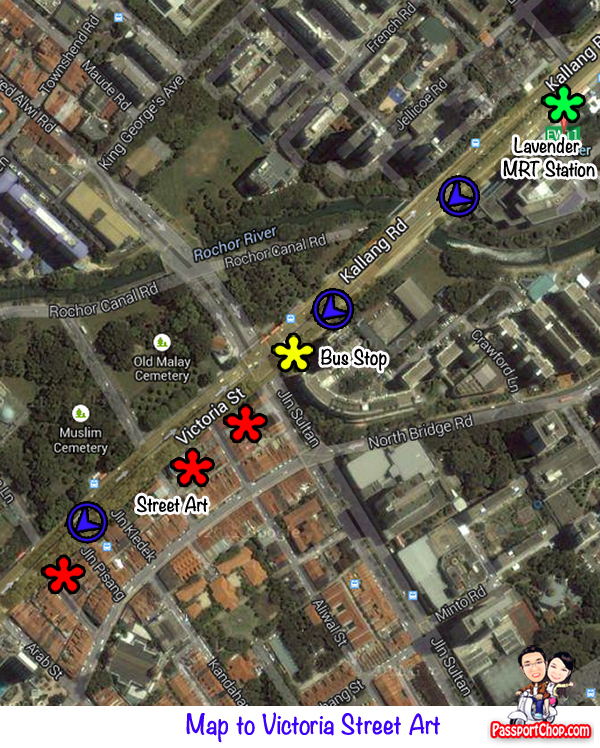 Please see the map below for detailed directions to get to the Jousting Painters and Minions (marked by the red star) at the intersection of Joo Chiat Terrace and Everitt Road from Eunos MRT station (marked by the green star). 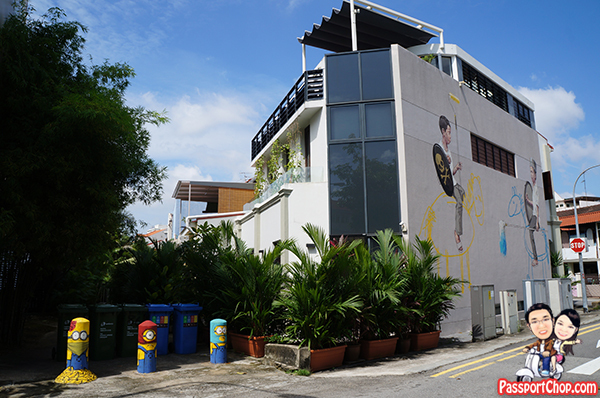 If you plan to get to the next set of street paintings by Ernest Zacharevic along Victoria Street, you can walk towards the bus stop (marked by the yellow star) along Joo Chiat Place (after Tembeling Road – not the one along Tembeling Road!) and take bus no. 33 which will bring you direct to Victoria Street (see next map for suggested alighting point along Kallang Road). If you are hungry after the long walk along Joo Chiat Terrace, there are quite a number of eateries along Joo Chiat Lane e.g. Fei Fei Wanton Mee (飞飞云吞面) at the intersection of Joo Chiat Lane and Everitt Lane (judging from the newspaper clippings, it is apparently quite famous but we find that the wanton mee is overpriced and servings quite small; the taste was slightly above average because of the hand-made noodles). These street art murals are done on the side walls of shophouses in Jalan Pisang and Jalan Klapa, facing Victoria Street, which houses events and marketing company amcasia!. When we were there, the mural along Jalan Klapa which showed children playing in supermarket carts had its trolley/shopping cart removed. 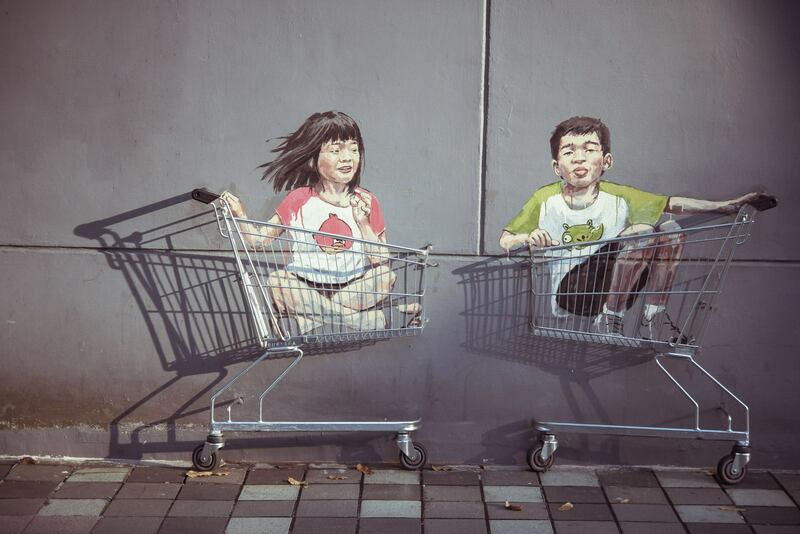 The mural had a part of an actual trolley attached to it, with handles passers-by can grab on to (as seen in the picture below – picture credits to Ernest Zacharevic’s Facebook album). 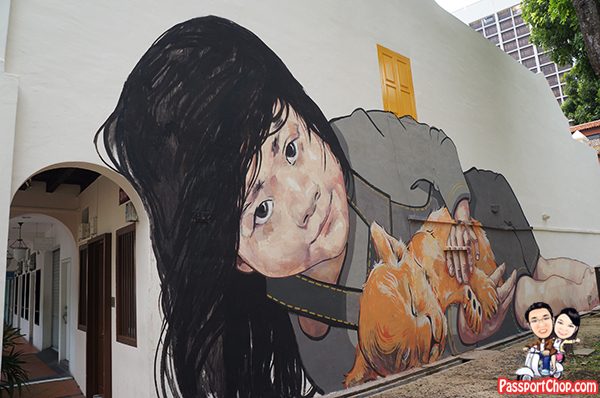 The gigantic street art mural of a Girl caressing a lion cub by Ernest Zacharevic – all of the above street paintings can be found just by walking along Victoria Street – this mural will be the last one along this road. This location was also where the infamous “MRT samurai” was arrested by police! Please see the map below for detailed instructions on how to get to the above street art murals by Ernest Zacharevic – if you are taking bus no. 33 from Joo Chiat Lane (after checking out the Jousting Painters and Minions), you can alight along Kallang Road at the bus stop marked by the yellow star (it is the bus stop immediately after Rochor River). Then upon alighting, just walk straight towards Victoria Street in the directions indicated in the map below. You will find the 3 street art murals (marked the red stars) along Victoria Street. If you are taking MRT to reach the murals, you can alight either from Lavender MRT station or Bugis MRT station; for Lavender MRT station, you can follow the directions indicated; for Bugis MRT station, it will be the opposite direction – just look for the exit that brings you to Victoria Street. Ernest Zacharevic has also done street art installations in Japan, Norway, Italy, and Lithuania, and is best known for the playful interactive art pieces that he created for the 2012 George Town Festival in Penang, where he is based. Nice post. I learn something new and challenging on blogs I stumbleupon on a daily basis. It will always be exciting to read articles from other authors and practice a little something from their websites. Aw, this was an incredibly good post. Finding the time and actual effort to create a good article… but what can I say… I hesitate a lot and don’t seem to get anything done. Looking cool! 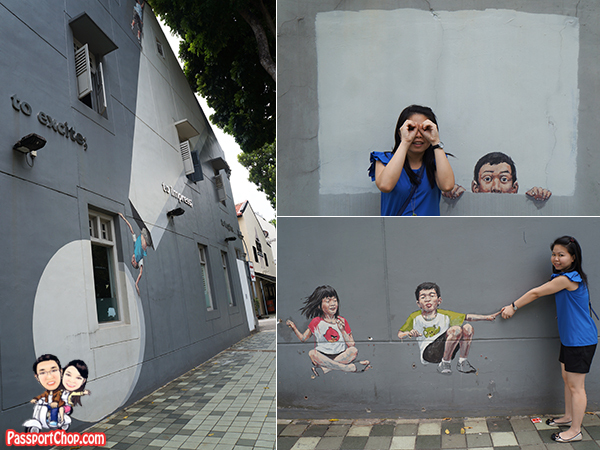 Ernest Zacharevic is one my favorite place in Singapore. I had experience about it. Last year I went there for business purpose. There has a lot friends and familiar of mine. Good news – the shopping carts seem to be back! I was able to take my picture there. Thanks for sharing this great overview, just a shame I missed the painters and bollards. I should have read your post before going there! I keep on busy reading blogs about travel specially Singapore, because i am planning my first ever vacation to this country alone, since it is near to my country, i know i can go by myself. So i hope you guys hear can give me more suggestion then. Thanks for the detailed treasure maps. After having seen most of Ernest‘s work in Penang, I was happy to find more in Singapore. The shopping trolleys are back, however, the minions have gone. May 2018.